Google Chrome is undoubtedly the best and secure browser till date. After all, it's a Google product and user's privacy is inherited. Your connection is 100% safe and in case if any malware is found on Internet, Chrome will let you know the exact problem and it will automatically stop the connection before any data is exchanged. Attackers might be trying to steal your information from www.google.com (for example, passwords, messages, or credit cards). There is a red color lock icon on screen with cross symbol on it. Moreover, the https of URL is marked in a red color with warning sign left to it (See in above picture). It comes as a surprise to me that how Google like giant website can show this privacy warning. Somehow, I managed to remove this error from Google Chrome. If you are also facing the same problem, then you might be worrying a little as it is concerned about your privacy and you wants to fix it as soon as possible. Here's a detailed information on this topic. "Your connection is not private" or "NET::ER_CERT_DATE_INVALID" error occurs due to the SSL error basically. SSL is short for Secure Sockets Layer. It's an extra security layer which keeps all your data private and safe. Normally when you enter confidential information like your username, password or credit card number, then the data is transmitted in a plain text which is very easy to hack. To fill this vulnerability, SSL was introduced which encrypts the data before transmission. It creates a secure connection between a client (or browser) and a server. Even if someone will gain access to the encrypted data, he can't be able to decrypt it and thus your information is safe. Most of the https enabled sites uses SSL connection. Google and Facebook are good examples. You will find a small green color lock icon in URL tab. Now the question arises, why this SSL connection error occurs. Most probably, either your Internet connection or system might be preventing Google Chrome from loading the page securely and privately and that's why you are getting this "Your connection is not private" error. Another reason could be the outdated or non-trusted SSL certificate which is very rare. How to fix "your connection is not private" error? The primary reason why you are getting this SSL connection error may be due to the inaccurate system clock. For some security reasons, Google Chrome will stop the connection and data exchange (especially for SSL sites) when your system date doesn't match with the correct time. Tap the data and time option in notification area available at the bottom-right corner of the screen. Now click "Change date and time settings" option. Next, click "Change date and time" button and make your adjustment. 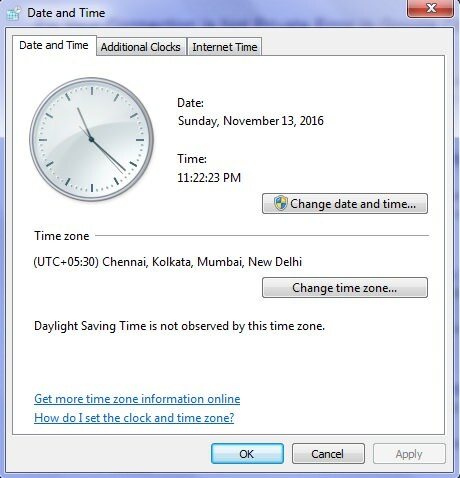 You can also change the time zone from the same window. Finally click OK button to save the changes. That's it. If you would like to synchronize the system time with an Internet time server, then go to "Control Panel > Clock > Date and Time > Internet Time". Now tick mark the synchronize option and then click "Update Now" followed by OK button. 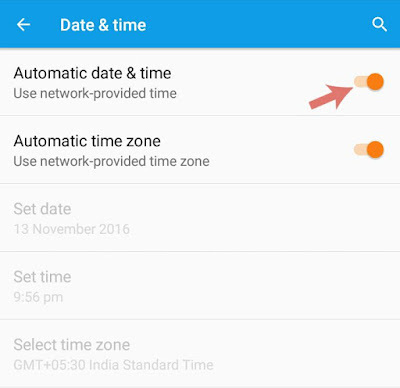 First go to Settings → Date and Time. Now switch on the "Automatic date & time" button. Or you can set it manually. Once you have corrected the date, relauch Google Chrome and visit the same website again. The error message should be gone most probably. This method worked for me as I have changed the date earlier to use WhatsApp obsolete version. If above method don't work for you, try to clear browsing data and reset all browser settings. Google Chrome may not be adopting the changes you have made in system clock. To delete the cache, cookies, history, saved password and other browsing data in Chrome, simply go to Settings → Show advanced settings → Clear browsing data under Privacy section. From the same window, you can reset the browser settings to its default. 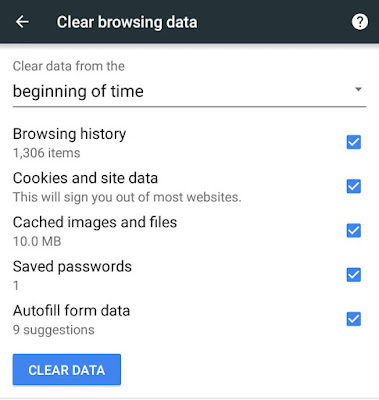 If you're on Chrome Android app, first tap the menu (three dots), then go to History → Clear browsing data. Alternatively, you can clear the Chrome app cache and app data from Android settings manually. 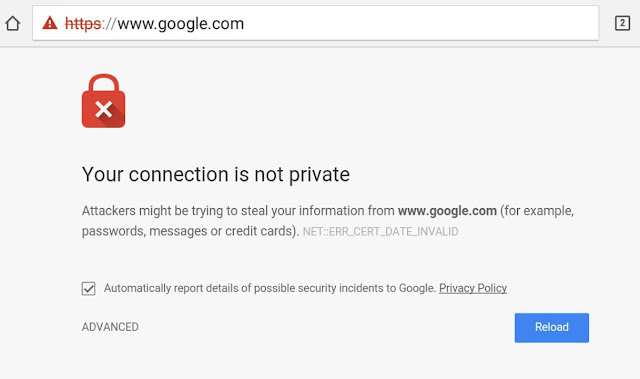 You may be using an outdated or obsolete version of Google Chrome and that could be the reason behind this "Your connection is not private" or "NET::ER_CERT_DATE_INVALID" error. Try to install the latest version of Google Chrome and it may fix the problem. You can download the exe file from Chrome's official website or use some other third-party services. Android and iPhone users can directly update it from their respective App Store. If you have installed any antivirus software in your computer or phone, then you have to check its settings to see if it has blocked any website or not. Most of the antivirus software have in-built Internet security option which scans all the websites you visit and verify them if they are safe or not. Sometimes antivirus will block the website's SSL certificate for some security reasons or by mistake. As a result, you will face this "your connection is not private” error when you attempt to visit the website. To solve this problem, just turn off the Internet Security options (HTTPS or SSL scanning) in antivirus software settings. Visit the website again and click on "Advanced" link when it shows an error message. After that, click the Proceed to website (unsafe) link. Use this method only if you are sure that the site is safe, otherwise attackers will steal your confidential information. There is an option in Chrome which lets you hide this warning message for a particular time period. If you visit the website regularly and get this SSL connection error every time, then you flag it as safe. Again this feature isn't available in mobile and latest desktop version. Now tap the drop-down arrow icon and select the option as per your own choice. After this, you have to proceed to the site for one time only and Chrome will remember your decision for specified time period. You will not be interrupted again. These are some easy methods to fix "Your connection is not private" or "NET::ER_CERT_DATE_INVALID" error in Google Chrome. Hope you have fixed everything with this guide. Let us know which method worked for you and please do share your views in below comment section.